Find out how getting dental implants in Pekin could significantly improve your oral health. While tooth loss can be a frustrating experience, treating your tooth loss doesn’t have to be. Our Pekin, IL, dentists, Dr. Stephen Dickey, know that you have a lot of choices when it comes to getting dental treatments that fit your needs. Learn more about dental implants and how this simple restoration could be all you need to replace your missing teeth for life. The metal post is the structure that will be taking over the role of your tooth roots. Once we’ve deemed you an ideal candidate for dental implants you will come back into our office for your first procedure. During this procedure, our Pekin general dentists will place the implant into the jawbone. This implant is made from a biocompatible metal like titanium, which means the body will not reject it. Once the implant is placed into the pre-drilled hole in the bone we will give your mouth time to heal. This is when the magic happens. What you won’t be able to see during the healing phase is that the bone and tissue, as they start to heal, will grow around the implant. This is known as osseointegration and it’s what makes a dental implant such a successful restoration for replacing missing teeth for the long term. Once the implant and bone are one, we can now open up the gums to place the next piece of the implant over the metal post. This piece is known as an abutment. If you think about a dental crown for a second, you probably know that the tooth that is getting the crown will need to be filed down and shaped so the crown can fit over the tooth. An abutment is similar to a prepared tooth. It is designed to support a dental crown but it also serves to connect the implant with the restoration. Once the gums have fully healed the dental crown can now be placed over the abutment to complete your new tooth. If you need to replace all or most of your teeth, multiple implants will be placed throughout the jawbone to support and stabilize partial and full dentures, as well. Implants offer a variety of benefits that other tooth replacements just can’t. It can prevent bone loss, support the muscles of the face, prevent teeth from shifting and last the rest of your life. Total Dental Care in Pekin, IL, is ready to give you back the smile you remember. 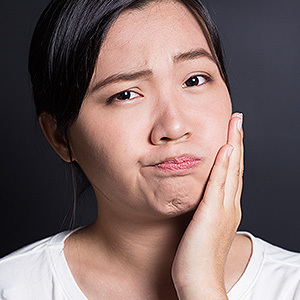 While losing a tooth is upsetting, it doesn’t have to be like this forever. We offer so many different options to give you back your smile the way you want.